Of the government and manners of the Arabians before the time of Mahomet, we have few and imperfect accounts; but from the remotest ages they led the same unsettled and predatory life which they do at this day, dispersed in hordes, and dwelling under tents. It was not to those wild and wandering tribes that the superb Palmyra owed its rise and grandeur, though situated in the midst of their deserts, where it is now beheld in its melancholy beauty and ruined splendor, like an enchanted island in the midst of an ocean of sands. The merchants who trafficked between India and Europe, by the only route then known, first colonized this singular spot, which afforded them a convenient resting-place; and even in the days of Solomon it was the emporium for the gems and gold, the ivory, gums, spices, and silks of the far Eastern countries, which thus found their way to the remotest parts of Europe. The Palmyrenes were, therefore, a mixed race--their origin, and many of their customs, were Egyptian; their love of luxury and their manners were derived from Persia; their language, literature, and architecture were Greek. Thus, like Venice and Genoa, in more modern times, Palmyra owed its splendor to the opulence and public spirit of its merchants; but its chief fame and historical interest it owes to the genius and heroism of a woman. Septimia Zenobia, for such is her classical appellation, was the daughter of an Arab chief, Amrou, the son of Dharb, the son of Hassan. Of her first husband we have no account; she was left a widow at a very early age, and married, secondly, Odenathus, chief of several tribes of the desert, near Palmyra, and a prince of extraordinary valor and boundless ambition. Odenathus was the ally of the Romans in their wars against Sapor (or, more properly, Shah Poor), king of Persia; he gained several splendid victories over that powerful monarch, and twice pursued his armies even to the gates of Ctesiphon (or Ispahan), his capital. Odenathus was as fond of the chase as of war, and in all his military and hunting expeditions he was accompanied by his wife Zenobia--a circumstance which the Roman historians record with astonishment and admiration, as contrary to their manners, but which was the general custom of the Arab women of that time. Zenobia not only excelled her countrywomen in the qualities for which they were all remarkable--in courage, prudence, and fortitude, in patience of fatigue, and activity of mind and body--she also possessed a more enlarged understanding; her views were more enlightened, her habits more intellectual. The successes of Odenathus were partly attributed to her, and they were always considered as reigning jointly. She was also eminently beautiful--with the oriental eyes and complexion, teeth like pearls, and a voice of uncommon power and sweetness. Odenathus obtained from the Romans the title of Augustus, and General of the East; he revenged the fate of Valerian, who had been taken captive and put to death by Shah Poor: the eastern king, with a luxurious barbarity truly oriental, is said to have used the unfortunate emperor as his footstool to mount his horse. But in the midst of his victories and conquests Odenathus became the victim of a domestic conspiracy, at the head of which was his nephew Maeonius. He was assassinated at Emessa during a hunting expedition, and with him his son by his first marriage. Zenobia avenged the death of her husband on his murderers, and as her sons were yet in their infancy, she first exercised the supreme power in their name; but afterward, apparently with the consent of the people, assumed the diadem with the titles of Augusta and Queen of the East. The Romans, and their effeminate emperor Gallienus, refused to acknowledge Zenobia's claim to the sovereignty of her husband's dominions, and Heraclianus was sent with a large army to reduce her to obedience; but Zenobia took the field against him, engaged and totally defeated him in a pitched battle. Not satisfied with this triumph over the haughty masters of the world, she sent her general Zabdas to attack them in Egypt, which she subdued and added to her territories, together with a part of Armenia and Asia Minor. Thus her dominions extended from the Euphrates to the Mediterranean, and over all those vast and fertile countries formerly governed by Ptolemy and Seleucus. Jerusalem, Antioch, Damascus, and other cities famed in history, were included in her empire, but she fixed her residence at Palmyra, and in an interval of peace she turned her attention to the further adornment of her magnificent capital. It is related by historians, that many of those stupendous fabrics of which the mighty ruins are still existing, were either erected, or at least restored and embellished, by this extraordinary woman. But that which we have most difficulty in reconciling with the manners of her age and country, was Zenobia's passion for study, and her taste for the Greek and Latin literature. She is said to have drawn up an epitome of history for her own use; the Greek historians, poets, and philosophers were familiar to her; she invited Longinus, one of the most elegant writers of antiquity, to her splendid court, and appointed him her secretary and minister. For her he composed his famous "Treatise on the Sublime," a work which is not only admirable for its intrinsic excellence, but most valuable as having preserved to our times many beautiful fragments of ancient poets whose works are now lost, particularly those of Sappho. The classical studies of Zenobia seem to have inspired her with some contempt for her Arab ancestry. She was fond of deriving her origin from the Macedonian kings of Egypt, and of reckoning Cleopatra among her progenitors. In imitation of the famous Egyptian queen, she affected great splendor in her style of living and in her attire; and drank her wine out of cups of gold richly carved and adorned with gems. It is, however, admitted that in female dignity and discretion, as well as in beauty, she far surpassed Cleopatra. She administered the government of her empire with such admirable prudence and policy, and in particular with such strict justice toward all classes of her subjects, that she was beloved by her own people, and respected and feared by the neighboring nations. She paid great attention to the education of her three sons, habited them in the Roman purple, and brought them up in the Roman fashion. But this predilection for the Greek and Roman manners appears to have displeased and alienated the Arab tribes; for it is remarked that after this time their fleet cavalry, inured to the deserts and unequalled as horsemen, no longer formed the strength of her army. While Gallienus and Claudius governed the Roman empire, Zenobia was allowed to pursue her conquests, rule her dominions, and enjoy her triumphs almost without opposition; but at length the fierce and active Aurelian was raised to the purple, and he was indignant that a woman should thus brave with impunity the offended majesty of Rome. Having subdued all his competitors in the West, he turned his arms against the Queen of the East. Zenobia, undismayed by the terrors of the Roman name, levied troops, placed herself at their head, and gave the second command to Zabdas, a brave, and hitherto successful, general. The first great battle took place near Antioch; Zenobia was totally defeated after an obstinate conflict; but, not disheartened by this reverse, she retired upon Emessa, rallied her armies, and once more defied the Roman emperor. Being again defeated with great loss, and her army nearly dispersed, the high-spirited queen withdrew to Palmyra, collected her friends around her, strengthened her fortifications, and declared her resolution to defend her capital and her freedom to the last moment of her existence. Zenobia was conscious of the great difficulties which would attend the siege of a great city, well stored with provisions and naturally defended by surrounding deserts; these deserts were infested by clouds of Arabs, who, appearing and disappearing with the swiftness and suddenness of a whirlwind, continually harassed her enemies. 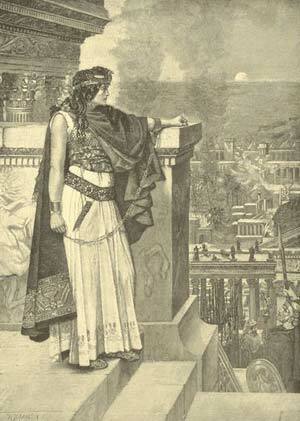 Thus defended without, and supported by a strong garrison within, Zenobia braved her antagonist from the towers of Palmyra as boldly as she had defied him in the field of battle. The expectation of succors from the East added to her courage, and determined her to persevere to the last. "Those," said Aurelian in one of his letters, "who speak with contempt of the war I am waging against a woman, are ignorant both of the character and power of Zenobia. It is impossible to enumerate her warlike preparations of stones, of arrows, and of every species of missile weapons and military engines." Aurelian, in fact, became doubtful of the event of the siege, and he offered the queen the most honorable terms of capitulation if she would surrender to his arms; but Zenobia, who was aware that famine raged in the Roman camp, and daily looked for the expected relief, rejected his proposals in a famous Greek epistle, written with equal arrogance and eloquence; she defied the utmost of his power; and, alluding to the fate of Cleopatra, expressed her resolution to die like her rather than yield to the Roman arms. Aurelian was incensed by this haughty letter, even more than by dangers and delays attending the siege; he redoubled his efforts, he cut off the succors she expected; he found means to subsist his troops even in the midst of the desert; every day added to the number and strength of his army, every day increased the difficulties of Zenobia, and the despair of the Palmyrenes. The city could not hold out much longer, and the queen resolved to fly, not to insure her own safety, but to bring relief to her capital--such at least is the excuse made for a part of her conduct which certainly requires apology. Mounted on a fleet dromedary, she contrived to elude the vigilance of the besiegers, and took the road to the Euphrates; but she was pursued by a party of the Roman light cavalry, overtaken, and brought as a captive into the presence of Aurelian. He sternly demanded how she had dared to oppose the power of Rome? to which she replied, with a mixture of firmness and gentleness, "Because I disdained to acknowledge as my masters such men as Aureolus and Gallienus. To Aurelian I submit as my conqueror and my sovereign." Aurelian was not displeased at the artful compliment implied in this answer, but he had not forgotten the insulting arrogance of her former reply. While this conference was going forward in the tent of the Roman emperor, the troops, who were enraged by her long and obstinate resistance, and all they had suffered during the siege, assembled in tumultuous bands calling out for vengeance, and with loud and fierce cries demanding her instant death. The unhappy queen, surrounded by the ferocious and insolent soldiery, forgot all her former vaunts and intrepidity; her feminine terrors had perhaps been excusable if they had not rendered her base; but in her first panic she threw herself on the mercy of the emperor, accused her ministers as the cause of her determined resistance, and confessed that Longinus had written in her name that eloquent letter of defiance which had so incensed the emperor. Longinus, with the rest of her immediate friends and counsellors, were instantly sacrificed to the fury of the soldiers, and the philosopher met death with all the fortitude which became a wise and great man, employing his last moments in endeavoring to console Zenobia and reconcile her to her fate. Palmyra surrendered to the conqueror, who seized upon the treasures of the city, but spared the buildings and the lives of the inhabitants. Leaving in the place a garrison of Romans, he returned to Europe, carrying with him Zenobia and her family, who were destined to grace his triumph. But scarcely had Aurelian reached the Hellespont, when tidings were brought to him that the inhabitants of Palmyra had again revolted, and had put the Roman governor and garrison to the sword. Without a moment's deliberation the emperor turned back, reached Palmyra by rapid marches, and took a terrible vengeance on that miserable and devoted city; he commanded the indiscriminate massacre of all the inhabitants--men, women, and children; fired its magnificent edifices, and levelled its walls to the ground. He afterward repented of his fury, and devoted a part of the captured treasures to reinstate some of the glories he had destroyed; but it was too late; he could not reanimate the dead, nor raise from its ruins the stupendous Temple of the Sun. Palmyra became desolate; its very existence was forgotten, until about a century ago, when some English travellers discovered it by accident. Thus the blind fury of one man extinguished life, happiness, industry, art, and intelligence through a vast extent of country, and severed a link which had long connected the eastern and western continents of the old world. When Aurelian returned to Rome after the termination of this war, he celebrated his triumph with extraordinary pomp. A vast number of elephants and tigers, and strange beasts from the conquered countries; sixteen hundred gladiators, an innumerable train of captives, and a gorgeous display of treasures--gold, silver, gems, plate, glittering raiment, and Oriental luxuries and rarities, the rich plunder of Palmyra, were exhibited to the populace. But every eye was fixed on the beautiful and majestic figure of the Syrian queen, who walked in the procession before her own sumptuous chariot, attired in her diadem and royal robes, blazing with jewels, her eyes fixed on the ground, and her delicate form drooping under the weight of her golden fetters, which were so heavy that two slaves were obliged to assist in supporting them on either side; while the Roman populace, at that time the most brutal and degraded in the whole world, gaped and stared upon her misery, and shouted in exultation over her fall. Perhaps Zenobia may in that moment have thought upon Cleopatra, whose example she had once proposed to follow; and, according to the pagan ideas of greatness and fortitude, envied her destiny, and felt her own ignominy with all the bitterness of a vain repentance. 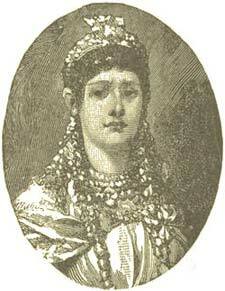 The captivity of Zenobia took place in the year 273, and in the fifth year of her reign. There are two accounts of her subsequent fate, differing widely from each other. One author asserts that she starved herself to death, refusing to survive her own disgrace and the ruin of her country; but others inform us that the Emperor Aurelian bestowed on her a superb villa at Tivoli, where she resided in great honor; and that she was afterward united to a Roman senator, with whom she lived many years, and died at a good old age. Her daughters married into Roman families, and it is said that some of her descendants remained so late as the fifth century.